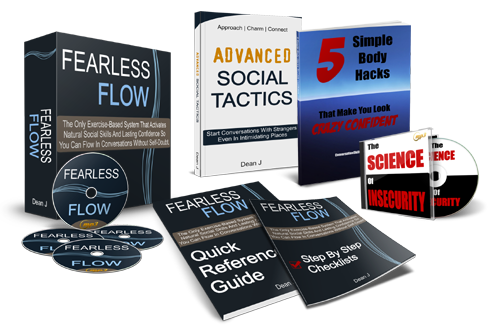 Thank You For Purchasing The Fearless Flow Conversation System! Your credit card statement will show a charge by Clickbank or CLKBANK*COM. The product name will not appear on the statement. IMPORTANT: Download course instantly by clicking the link below that says “Click Here To Download” (The file is rather large so download may take several minutes). Your “Unannounced Bonus” – Improv Comedy Principles To Start Conversations And Continue Them is included with your download. Simply right click the link above and choose “Save As.” (Mac users press “control + click”). If you have any trouble downloading or opening the file click the link below for help. If you’re having trouble downloading the entire Fearless Flow system from the link above because it’s too big, you might try downloading it in parts. Click (or right click) on “Part 1” and choose “Save As”. Save the file to your desktop. Do the same with each “part” individually saving each to the same location on your computer. Once you’ve downloaded all the “parts,” open the file ending with “zip.001”. This will open up in a new window and you should see a folder titled “Fearless Flow System”. Just drag this folder to your desktop. Inside will be all the audios and guides. Afterwards, you can delete the .zip files from your computer.